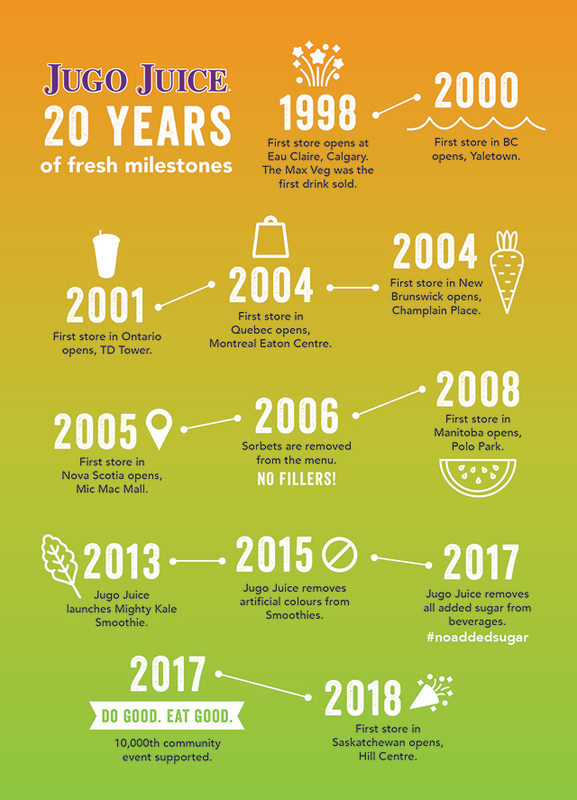 Jugo Juice will celebrate its 20th anniversary on November 20 with a birthday party for the ages! The innovator behind the ‘smoothie revolution’ will offer 50% off smoothies all day – a tasty treat you can’t resist! Originally founded in Calgary in 1998, Jugo Juice is a pioneer in the evolution of the healthy beverage in Canada, providing delicious, healthy, on-the-go alternatives to traditional fast food. From its first drink served, the Max Veg, to the launch of one of the first green smoothies, the Mighty Kale, and even becoming the first quickserve restaurant to have a 100% no added sugar beverage menu, Jugo Juice has been a pioneer in offering Canadians a delicious yet healthy way to fuel better. 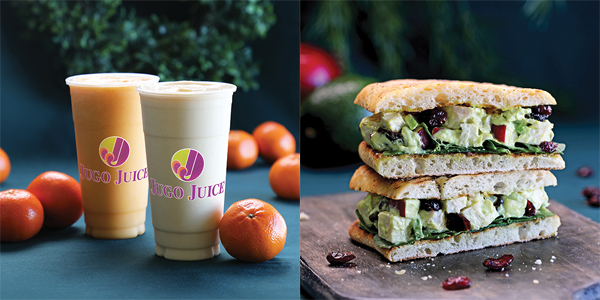 Canadians can sing Happy Birthday and ring in the new holiday season with Jugo Juice’s limited edition holiday menu items: the Merry Mandarin Smoothie, Dreamy Orange Protein Smoothie and Holiday Chicken Salad Sandwich. Available Nov 20th until January 8, 2019. Merry Mandarin: First introduced in 1999, this classic crowd pleaser is perfect for the holidays. A fresh spin on an old-time favourite, the Merry Mandarin is back and better than ever with fresh mandarin oranges, mangos, tropical juices and the addition of Fiasco Gelato’s no added sugar frozen yogurt. Dreamy Orange Protein: This new feature smoothie will have you packing a punch in your dreams with its protein benefits. Think orange creamsicle but with better-for-you ingredients such as fresh mandarin oranges, mangos, orange juice, coconut milk and vanilla whey protein. Holiday Chicken Salad Sandwich : This everyday fire-grilled chicken sandwich has a holiday twist with dried cranberries. Not to mention fresh celery, apples, spinach and avocado aioli on a herbed schiacciata bun. No added sugar or artificial ingredients. Natural, unprocessed foods. 140 locations. After opening its doors 20 years ago, Jugo Juice now boast 140 locations nationally and is the only quick serve restaurant in Canada to offer a full selection of smoothies and juices that contain no added sugars or artificial ingredients. Completely transparent about the ingredients in their beverages and food, Jugo Juice believes that natural, unprocessed foods are the cornerstone to healthy living. Supporting over 10,000 local events and causes since opening its doors in 1998, the company is an advocate of building strong communities and sponsors sporting events, local athletes and community social clubs. To learn more about this Canadian success story visit www.jugojuice.com.